Western blot analysis of extracts from untreated (-) or treated with IFN-α (100 ng/ml, 5 min; +) HeLa cells using Phospho-Stat3 (Tyr705) (D3A7) XP® Rabbit mAb (HRP Conjugate). 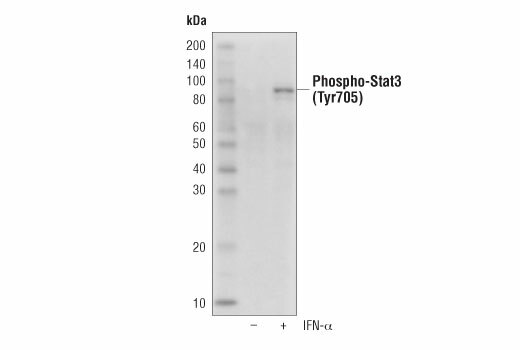 Phospho-Stat3 (Tyr705) (D3A7) XP® Rabbit mAb detects endogenous levels of Stat3 only when phosphorylated at tyrosine 705. This antibody does not cross-react with phospho-EGFR or the corresponding phospho-tyrosines of other Stat proteins. Monoclonal antibody is produced by immunizing animals with a synthetic phosphopeptide corresponding to residues surrounding Tyr705 of mouse Stat3. This Cell Signaling Technology antibody is conjugated to the carbohydrate groups of horseradish peroxidase (HRP) via its amine groups. The HRP conjugated antibody is expected to exhibit the same species cross-reactivity as the unconjugated Phospho-Stat3 (Tyr705) (D3A7) XP® Rabbit mAb #9145.